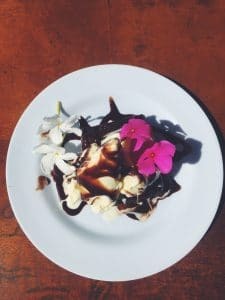 Room2Board Hostel and Surf School | Best Desserts in Jaco, Costa Rica! Jaco is a great place to go if you are looking to satisfy your sweet tooth! I will share with you some of my favorites and some insider tips of the best desserts to sink your teeth into. If you are looking for a large variety of local foods you need to check out the Feria de Jaco or Jaco’s Farmer’s Market. 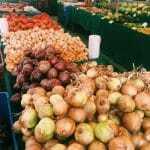 Prices are lower than the supermarket and the food is fresh and local. It is held every week right next to Garabito Clinic which is just around the corner from Room2Board. The stalls are set up Thursday evening from 5-10 and Friday morning from 7-2. You can find all your fruits and vegetables, juices, chocolate, cheese, yogurt, spices, hot sauces, jewelry, succulents, meats, and even sweets! Our favorite stall to go to is run by Isaac Mena and is called Meno Delicias. He and his wife make everything homemade! My personal favorites are his massive cinnamon rolls for 850c. 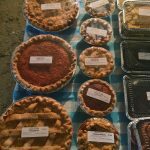 He also makes very good apple pie, granola, homemade peanut butter and jams, bread, chocolate cake, whoopie pies, and apple turn-overs. Based in Playa Hermosa Cookie 506 Alfajores are to die for! Classic dulce de leche filling sandwiched between two shortbread cookies and dipped in chocolate. White chocolate, milk chocolate, and dark chocolate with peanut butter are your options. I recommend having a chilled cookie in the afternoon with an iced coffee for a little refreshing pick-me-up. You can buy these at Room2Board, Bowie’s Point, Bohio Café, Playa Dulce Jaco, and Heladeria El Barco. If you are looking for cinnamon rolls, cakes, brownies, savory treats, or rolls with jam head over to Pachi’s Pan. Pachi’s Pan is a local bakery located on the left-hand side of the main street and across from MasXMenos. Each dessert is around 500c and freshly made. If you come after 7pm you may be able to get 2 desserts for the price of one! This bakery is perfect for a quick snack before grabbing the bus. The best brownie in town resides at Room2Board. For a little over $6 you will get a warm frosted square of brownie, 2 scoops of vanilla ice cream, and chocolate drizzle. I have tried brownies all over the world and this is the winner! The simplicity and flavor of the quality ingredients make you want to come back for more – multiple times a week. For the healthier and more refreshing option go to Frutas y Tablas located across from the bar Swell. Frutas y Tablas serves a variety of smoothies and Acai bowls. Acai is a super fruit rich in antioxidants. The ingredients are all fresh and no sugar is added. My favorite bowl is called Good Day which has bananas, strawberries, and pineapple in a bowl. 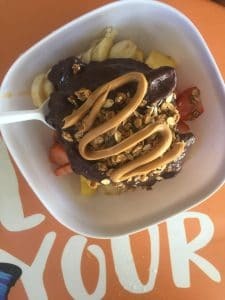 The Acai is blended up and poured over the fruit and topped with granola and honey. This costs 4000c although I always add peanut butter for an additional 500c. This is the dish to order after surf, in the middle of the day for a cool down, or for a healthy start to the day. Keep in mind they do close at 5pm. Marsican Gelato is a cute artisanal gelato lounge located on the main street. The atmosphere is cozy, inviting, and a perfect break from the heat. 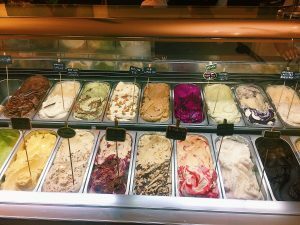 The gelato is all made in house with natural ingredients. I have tried key lime pie, iced espresso, snickers, salted caramel, and mint. All the flavors were amazing and delicious. Make sure you do bring cash as they do not accept cards. 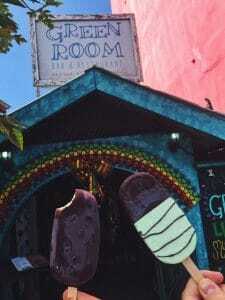 Along the lines of gelato, a restaurant called The Green Room has a small store that sells awesome gelato popsicles called Vanilla Gelato. I have had the mint, peanut butter, black cherry, and chocolate and berries. The bars cost around 1500c to 1800c. 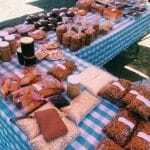 The store also sells granola, honey, coconut oil, spices, chips, tea, coffee, and a variety of other health foods. Make sure to visit The Green Room after 7 for live music and taste one of their craft beers. 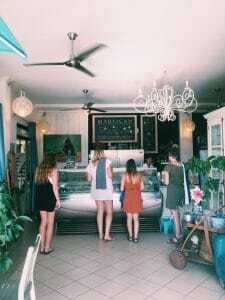 I hope you are able to try some of these tasty treats in Jaco and even add more to your list! Treat yourself!